Believe it or not, the next round of corporate earnings will start coming out next week with the banks kicking off the first quarter earnings season. I have mentioned on several occasions that I am concerned about this earnings season because the year over year results are going to be compared to the first round of results after the tax overhaul. And after seeing several years where earnings were growing double-digit percentages, I don’t know if investors are ready for an earnings slowdown. That is a great way of stating what I see happening this earnings season. Rather than earnings growing like they have for the past few years, I expect some companies to post declines in earnings. What I see happening even more than earnings declines is a tremendous slowdown in the earnings growth rates. 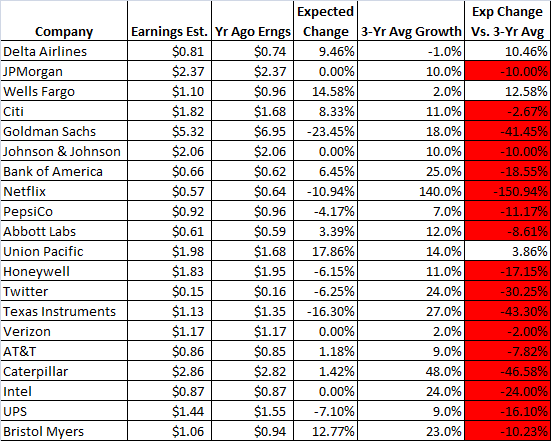 To get an idea of what to expect, I looked at the earnings calendar from April 10 through 25 and took down the names of 20 companies. I tried to make it a good mix of well known companies from various sectors. There are several bank stocks on the list, there are a couple of semiconductor companies, consumer staples, etc. Once I had the list, I looked at the EPS estimate for the impending earnings report and then compared it to the same period from one year ago. This gave me the expected change. I then compared the expected change to the average EPS growth from the last three years. The news wasn’t good. You can see that only three companies on the lost are expected to show a bigger EPS change in the quarter than what they have averaged in the last three years. One of them is Wells Fargo and it went through so many investigations and got fined numerous times in the last few years, so I’m not even sure it should count. This is the kind of scenario that worries me. I don’t know if investors have prepared themselves for such a slowdown. The rally that started after Christmas has been awfully strong and I think that reflects a rather bullish sentiment from investors. Of course, the market was completely oversold in December and a rally was due, but the rally has been too strong in my eyes. Personally, I get the feeling that investors have been distracted by the trade war and the Fed and haven’t really considered the possibility that earnings are not going to be growing at the same rate they have in recent years. I was talking with one of my old basketball coaches yesterday and the market came up during our conversation. He is retired now and he is 70-years old. He was telling me how he had most of his money in stocks still and I cautioned him about that and told him about some of the research I was doing for this article. I didn’t tell him to sell all of his stocks and equity ETFs, but I did suggest that he might want to take some profits off the table and shift it into fixed income investments. That is the same thing I would suggest to everyone. I am not suggesting that the market is going to completely tank during the earnings season, but I do think the post-Christmas rally is going to slow down during this earnings season. Taking some profits off the table probably wouldn’t be a bad thing.